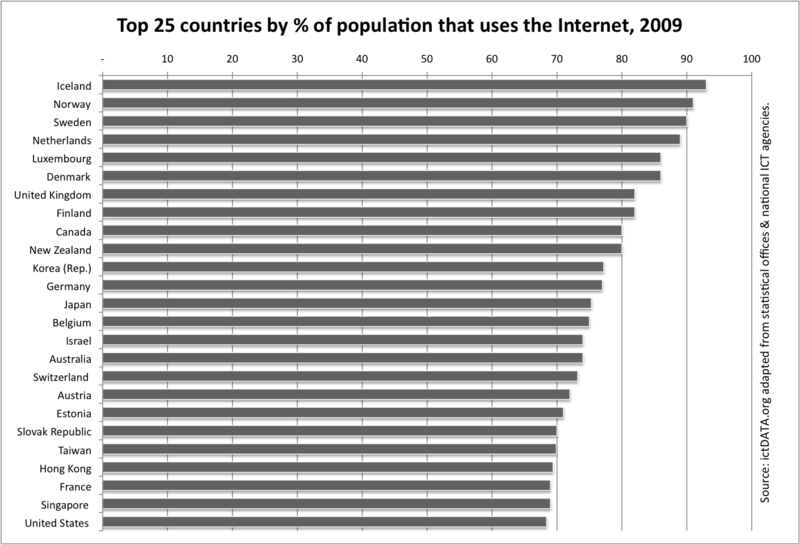 Little Iceland ranks first for 2009 in the percentage of population that uses the Internet. Some 93% of Icelanders between the ages of 16-74 used the Internet at least once within the last three months. Other Nordic countries, namely Norway and Sweden, follow Iceland in the rankings, also with Internet penetration rates over 90%. 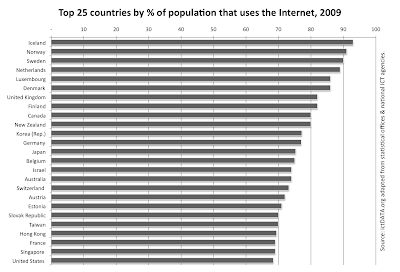 Somewhat surprisingly, the United States only ranks 25th in Internet penetration. According to the US Census Bureau, 68.4% of Americans aged 3 and over used the Internet in 2009. This is the lowest of any developed Anglophone country except for Ireland. Note: Canada: 16+ used in last year. New Zealand: 15+ used in last year. Korea (Rep.): 6+ used once a month. Japan: 6+. Israel: 13+, ever used, Jewish community. Australia: 15+. Switzerland: 14+ used in last 6 months. Taiwan: 15+ ever used. Hong Kong: 10+ used in last year. Singapore: 7+, used in the last year. United States: 3+. ALL OTHERS, AGES 16-74 USED IN LAST 3 MONTHS. Source: ictDATA.org adapted from national statistical offices or ICT agencies (except Israel: TNS/Teleseker).